When you’re unpacking your groceries, keep the fruits, veggies, nuts, and any other snacks out on the counter. Once you’re done unpacking, wash, cut and bag your produce. Put all of your snacks into individual baggies. This way when you are in a rush, it’s just as easy to grab a healthy snack than it is a sugar-filled granola bar. Pick one morning, afternoon or evening to do all of your meal prep for the week. If prep is done right, it doesn’t have to take an entire day! Throw your chicken breasts and veggies into the oven at once. While those are baking, boil some eggs on the stove. While those are boiling, put together 3-4 overnight oat jars for breakfasts. You can even put a casserole together and put in the oven once the chicken and veggies are done. If you have what you need ahead of time, meal prep shouldn’t take long! Buy or prep foods that can be used in multiple meals or snacks. Chicken, breasts or shredded, can be used as an entree, in a sandwich, soup, wrap, salads or casserole. Rice can be used as a side dish, in a salad, stir fry or burrito. If you’re taking the time to prep it, you may as well get the most out of it! 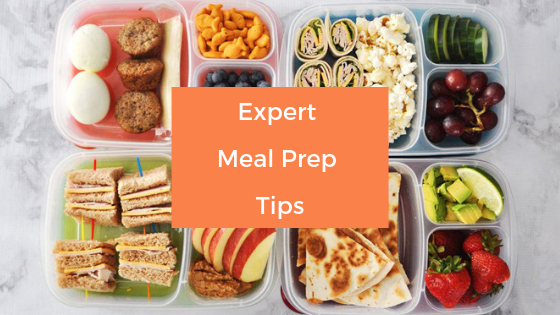 Once your prep is done, portion your meals into the containers/bags you will be needing them for the week. Put the casserole into their own individual Tupperware, move your chicken and veggies into several combined containers. This takes one extra step out of packing lunches when you’re in a hurry! Use these 4 simple, yet effective, meal prep tips to set yourself up for a successful, healthy week of eating! For more information on nutrition, ask us about our Life Program. Email any inquiries at admin@encompassfitness.ca.